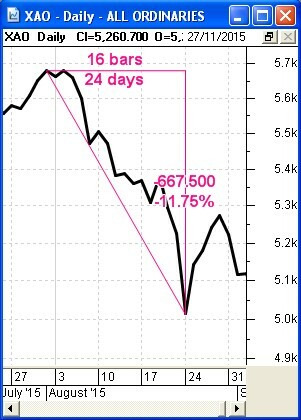 Since I wrote about Nimble Short Term Investing a few months ago, I have been talking with a number of people about the topic of exit strategies. Many market participants ask themselves how they can capture and lock in profits, and protect their capital from downside risk, with the best approach to an exit strategy. This became even more front of mind when the market index fell 11 percent in the first three weeks of August (see daily chart of XAO index at right - click on it for a larger version). Unfortunately, there are many possible ways to determine the best time to exit a position, and none of them are wrong. I wrote about these in the eBook Articles some time ago, and in earlier editions of this eNews. But with the market proving challenging for the preservation of capital, it is opportune to re-visit this topic. In addition to this, I was invited to be guest speaker at the November meeting of the Newcastle ATAA chapter, with the opportunity to deliver two presentations. So I offered to update my earlier materials on Exit Strategies and talk about this to the group, and to promote some discussion amongst the local members so they can help each other with their own experiences. I wanted to include that updated material in this edition of the eNews, so I needed to hold it over a little longer than usual (hence this edition is a little late). So, in this edition of the eNews there are updated eBook Articles, and the revised slide presentation. See all the details in This Month's Focus section below. If you would like to see a history of the Toolbox changes, see the special content update blog, and you can select the option there to "Follow" that blog to get details about new updates as soon as they are made. Any non-member who no longer wants to receive this material on a monthly basis can simply unsubscribe from ALL topics using the SafeUnsubscribe link at the bottom - or just Update Your Profile to change your interests. BUT NOTE: Toolbox Members and BullCharts mailing list members should not unsubscribe, as it will remove you from all my mail lists and you will no longer get any emails. Here's a short note to the recently new Toolbox Members, and new readers of this monthly email:- These share market Toolbox eNews emails always go to Toolbox Members (a part of the Toolbox service), and to the people who have registered to receive occasional information about the Share Market. This is a monthly email with some pointers and tips on focused topics - see a quick intro to the eNews emails. They often include references to specific eBook Articles in my Share Market Toolbox, as well as key web pages in the free area of the Toolbox (eg. on the extensive Share Market web page). I have been writing the eBook Articles since October 2008 - that's a few years now - and these eNews emails help you to navigate to related and useful information each month. You can see the past eNews emails in the eNews Archive. Don't believe it? See some supporting evidence. For this edition of the eNews I have waded through four of my existing eBook Articles and added extra information, and tweaked the wording in several places. I have also updated my slide presentation on this topic. Exit Strategies web page has been revised. Exit Strategies slide presentation has been updated. eBook Article TA-6030, "Exit strategies - introduction" - This free 4-page article was originally published in 2012, and has been refreshed a little. eBook Article TA-6031, "Exit strategies Part 1 - Time, price, money" - This 5-page article from 2013 has some additional material and is now 7 pages long. It focuses on time-based exits, price target exits and money-based exits. eBook Article TA-6032, "Exit strategies Part 2 - Price chart features" - This 4-page article is extended to 6 pages and talks about exit methods based on price chart features - things like identifying weakening trends, and using the Count Back Line tool and an introduction to using various candlestick patterns. eBook Article TA-6033, "Exit strategies Part 3 - Chart indicators" - This 8-page article is extended by one page to 9 pages, and describes a number of exit methods that utilise technical analysis chart indicators such as: Moving Averages, Weinstein's approach, Parabolic Stop and Reverse P-SAR, and more. Toolbox non-Members who can't see any of the reserved eBook Articles can at least see the first page of each from the Articles Table of Contents page in the Toolbox. The Technical Analysis and Share Trading tables of contents are updated as appropriate. Regarding my growing collection of eBook (PDF) Articles, don't forget to see the latest Table of Contents pages for these articles (see links in the side-bar above right). You can also see the Table of Contents for all eBook Articles (recently new or updated ones are highlighted), and the Toolbox Master Index which includes the eBook Articles, plus web page references, and helpful videos.